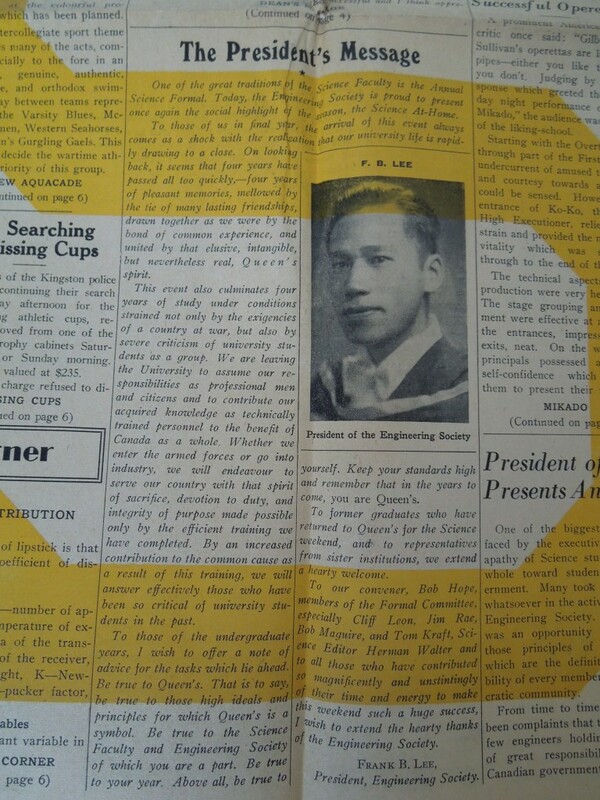 Frank B. Lee, born in Montreal to Chinese immigrant parents, had a very successful academic and extracurricular career at Queen’s University from 1941-1945. During his time in Kingston, he spoke publicly about the Chinese war effort and wrote a number of letters to editors protesting discrimination against Chinese in Canada. Lee enrolled in the electrical engineering program at Queen’s University at the age of 22. When he graduated in 1945, he appears to have been the only graduating Science ’45 student who was ethnic Chinese. During his years at Queen’s, Lee won nine scholarships, including three for public speaking. In his junior year, Lee was the Science representative on the Alma Mater Society Executive Board, which represented the various parts of the Queen’s student body. In his senior year, he was elected President of the Engineering Society, the first time a Chinese student had been elected to this position, and again was a member of the Alma Mater Society Executive Board. 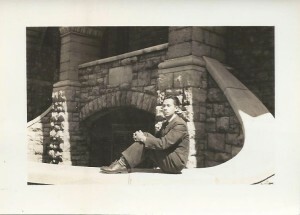 Lee was selected on the basis of leadership and scholastic achievement to be listed in the 1943-44 and 1944-45 issues of “Who’s Who Among Students in American Universities and Colleges.” In 1945, he was elected to the honorary Tricolour Society for distinguished service to the university in non-academic and non-athletic activities. While Lee was a student at Queen’s, he engaged frequently in public speaking and wrote numerous letters to the editors. In his speeches, his most frequent topic was China at war – the heroism and suffering of its people, and the need for greater support from the Western powers in resisting Japanese aggression. 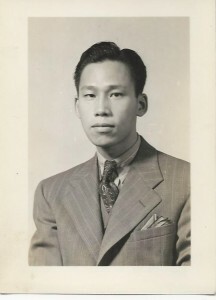 In his letters to the editor, which were published in the Kingston Whig-Standard and the Ottawa Citizen, he denounced discrimination against Chinese-Canadians and appealed to democracy, equality, and fair play. 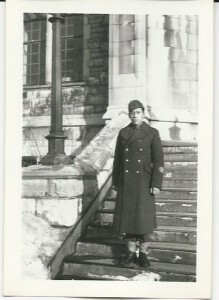 After graduation, Lee was commissioned as a second lieutenant in the Royal Canadian Electrical and Mechanical Engineers and went into training at the barracks in Barriefield, Ontario. He was discharged a few months later, since the World War II had ended. Lee then returned to Kingston and became an instructor at Queen’s. During that time, Lee submitted an application to become an officer in the Royal Canadian Navy. 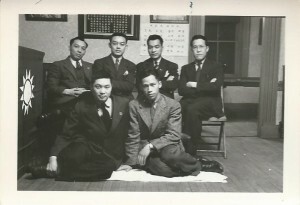 After the head of the Navy selection board told him that he would probably not be accepted because he was of the Chinese race, Lee embarked on a letter-writing campaign to federal government leaders and Ontario newspapers urging the repudiation of this discriminatory policy. He obtained the strong support of the Toronto Globe and Mail and coverage in other newspapers. 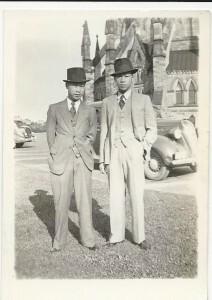 Ultimately the Minister of National Defense stated on the floor of the House of Commons that the Navy did not have a policy of discriminating against Chinese, that the recruiting officer had expressed doubt that Lee would be selected because he appeared to be older than the average candidate, and that any views that the officer had expressed about Lee’s race were only his personal opinion. 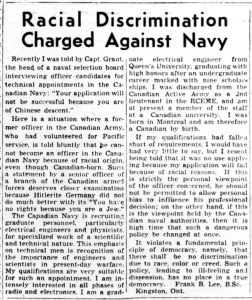 Thus, Lee’s campaign against discrimination embarrassed the Canadian government into publicly asserting that the Canadian armed forces did not discriminate on racial grounds — a repudiation of the Navy’s previous practice of excluding Chinese-Canadians as officers.